After Saturday’s 2-1 win at Martha’s Vineyard, a few players on the Bishop Stang girls’ hockey team headed back to the locker room with tears in their eyes. With the victory, the Spartans (10-2-1) locked up the program’s first state tournament berth since the team was elevated to varsity status in 2013-14. “We were all so excited,” said Bishop Stang junior defenseman Elizabeth LePage . In 2016, the tourney was not on the radar for Stang, which recorded a 5-13-2 finish in its third season. The next year, it was 7-12-1. A year ago, the Spartans (8-9-3) fell 1 point shy after a season-ending tie against Cohasset/Hanover. That season-ending loss, according to senior goalie Sierra Majewski , served as motivation for the Spartans. 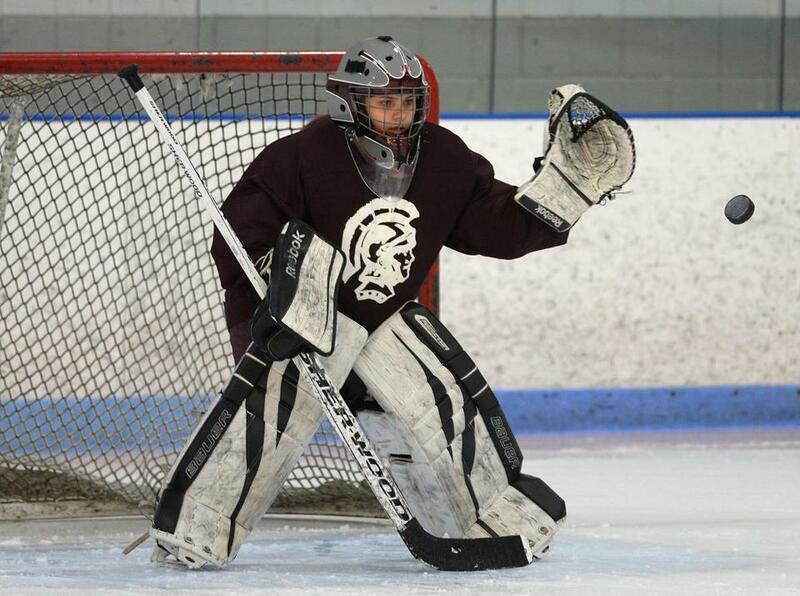 “It really hurt,” recalled Majewski, a Westport resident who has posted a 2.19 goals against average this season. Stang is following the lead of LePage, who skates on the first defensive pairing and paces the Southeastern Massachusetts Girls’ Hockey League (SEMGHL) with 18 goals and 12 assists. LePage played a role in both goals Saturday, scoring one and assisting on the 10th goal of the season for junior Janey Silvia . “She’s a very skilled player,” coach Bill Theodore said of LePage, a Swansea resident who attends Joseph Case High School. 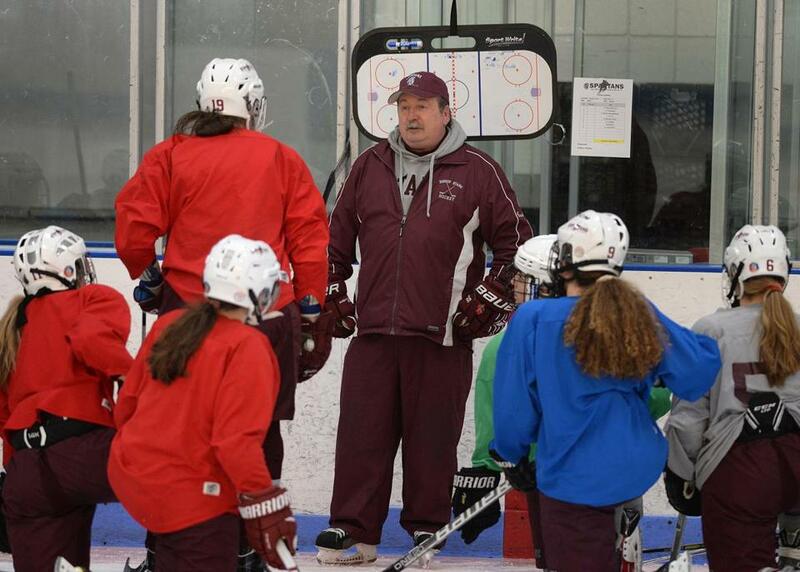 Bishop Stang coach Bill Theodore coaches the team during a practice at the Hetland Memorial Arena. LePage deflected the praise to her teammates. The Spartans have outscored opponents, 57-27, and currently sit atop the SEMGHL standings with a 7-1-1 conference record. Stang will try to avenge its only league loss Wednesday against Norwell in New Bedford. 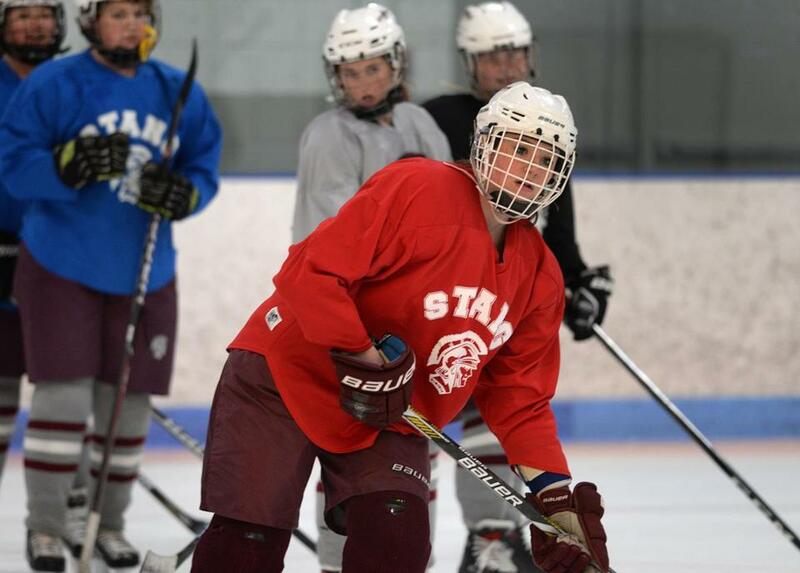 Bishop Stang defender Elizabeth LePage works on a passing drill at practice. Theodore credited this season’s strong start to a natural maturation of his program, one that also hosts players from Case, Coyle & Cassidy, Dartmouth, New Bedford, and Somerset-Berkley. And no doubt, Stang earning a spot in the postseason is a big deal for girls’ hockey on the South Coast. The Bourne/Mashpee/Wareham/Old Rochester co-op was the first, last season. ■ Last Saturday, Westwood hosted Dover-Sherborn in a game played to benefit the I AM Strong Foundation. The charity works to emphasize treatment for mental health issues in teens. For the last four seasons, Westwood has chosen to play one game a year to support the local charity. This season, Westwood raised $800 for the I AM Strong Foundation. The foundation was started by Westwood resident Donna Medina. Her daughter, Isabelle, passed away in middle school. She would have been a senior this year. Wednesday, Duxbury at Pembroke (at Bridgewater Arena, 4 p.m.) — With a state-best 14 wins, the Dragons visit 15th-ranked Pembroke looking to cement their status as the top team in the South. Wednesday, Austin Prep at St. Mary’s (at Connery Rink, 8 p.m.) — Austin Prep took the first meeting, 2-0, on Jan. 12. Can St. Mary’s hand Prep its first loss? Thursday, Andover at Westford (at Groton School Rink, 7 p.m.) — The Warriors were humbled in a loss to Methuen/Tewksbury last week, but get another crack at a ranked opponent with a trip to face the Grey Ghosts. Saturday, Notre Dame-Hingham at Austin Prep (6 p.m. at Essex Sports Center) — Another clash between a pair of ranked teams. Austin Prep hosts an NDA squad which registered back-to-back strong performances against defending D2 champ Wellesley. Saturday, Braintree at Needham (6:40 p.m. at Babson Rink) — For the fourth straight game, the Wamps take on a ranked opponent in conference rival Needham, looking to move a step closer to clinching the Bay State title. Dan Shulman also contributed to this story. He can be reached at dan.shulman@globe.com. Jenna Ciccotelli can be reached at jenna.ciccotelli@globe.com.